The mushroom soup was thick and creamy but served tepid. Salad with a poached egg. 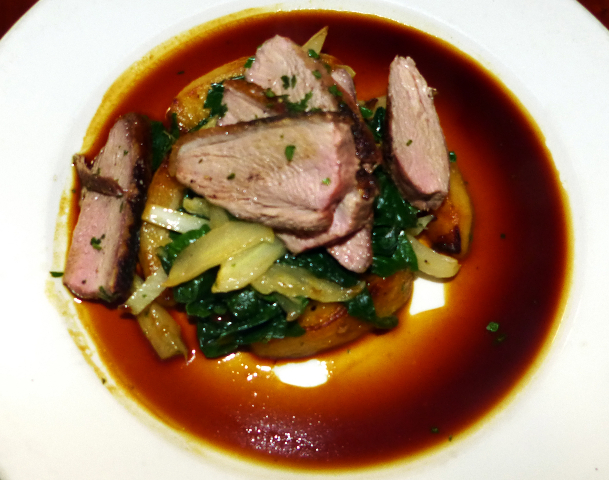 Duck over wilted greens with an apple reduction sauce. Pork loin au poivre was disappointing. 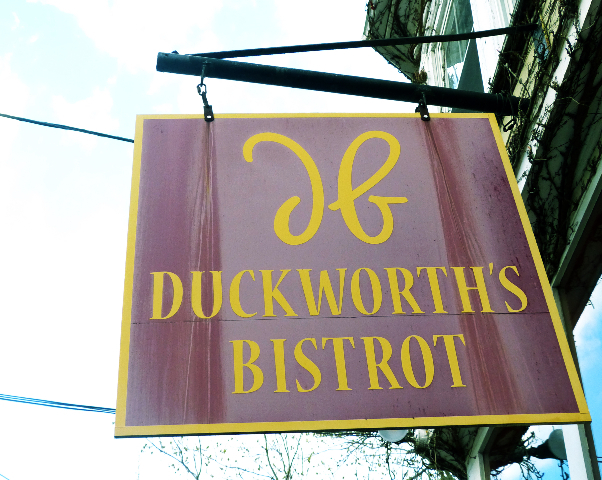 While visiting Gloucester last summer we were unable to make a reservation at the renowned Duckworth's Bistrot. 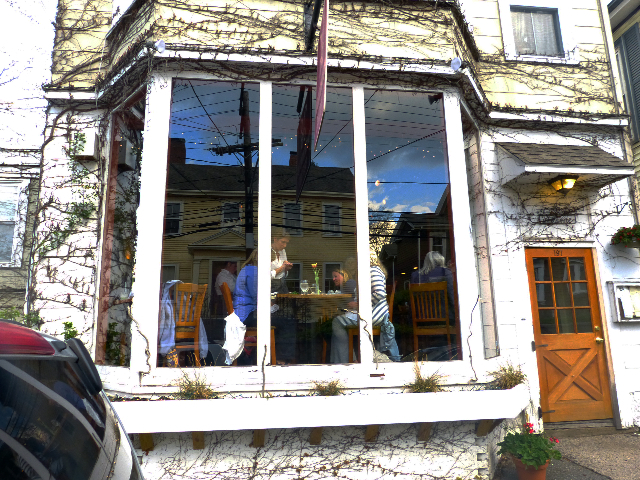 It is widely regarded as the top destination for fine dining on Cape Ann. During the first week of May we were more fortunate with a table for two at 6:30 PM on a Tuesday night. The three prime window tables were taken and we settled for mid room. The space is compact and sparsely but well appointed. There is a dramatic bay window that emits ambient light. While the restaurant is dense, with bare wood tables, the sound level when fully occupied, as it was by 7 PM, is tolerable. There is a high and soft paneled ceiling so we were able to converse comfortably. The server brought a basket of crispy bread with oil for dipping. Looking at the long list of wines by the glass, most for $10 and circa 2013, we passed. Instead I opted for the creamy mushroom soup with a garnish of sautéed mushrooms. The website lists it at $8 but the menu stated $10. It seems generally true that the online menu is out of date and that prices for most items have been increased by $2. 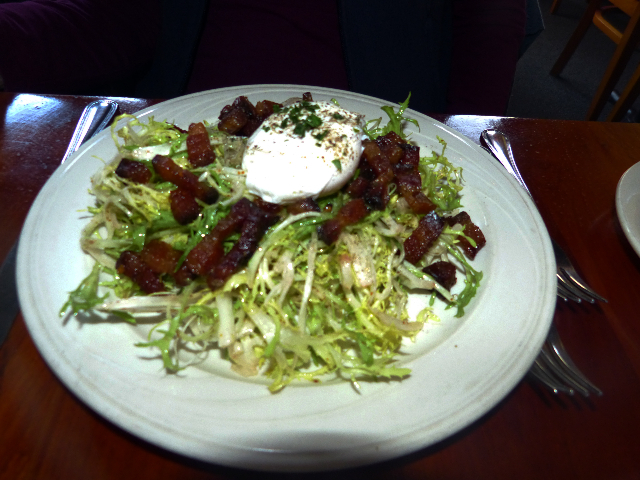 As a starter she ordered the Ubiquitous Bistrot salad with frisee and bacon topped by a poached egg. It was dressed with whole grain mustard vinaigrette. We asked for two spoons so we could both sample the soup and I had some of her salad and bacon. 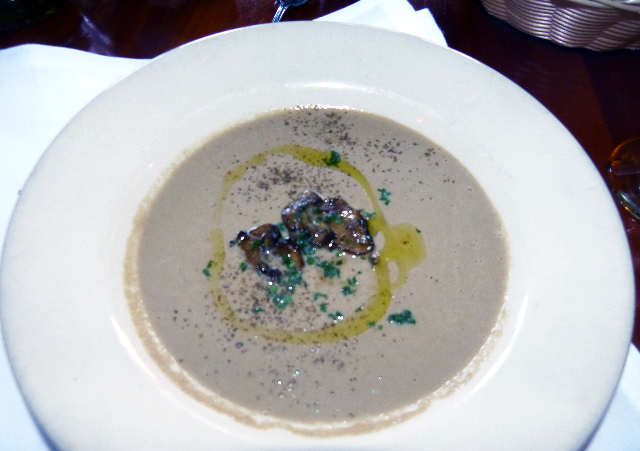 The soup was indeed rich and creamy with a dark brown color reflecting a dense puree of mushrooms. It was, however, served lukewarm. I mentioned that and she agreed but didn’t want to comment and spoil my experience. It was to be the first of lapses of attention that one does not expect from first class restaurants. My water glass remained empty while the waitress was tending to other tables. But another staff member noted it and stopped by asking if we needed any help. We asked to have the bread removed to make more room on the small table for the arrival of entrees. This was done quickly and courteously. While ordering I inquired about several dishes. It was an easy decision for her to ask for duck breast. I had the difficult decision among a variety of options for seafood, meat and poultry. Pork loin is something we often prepare at home and I was interested in trying a different approach. Served roasted “au poivre” she assured me gave it a kick. Also the chef is noted for sauces. That sold me on a full portion at $28. She had the smaller portion of duck ordered well done. It was served over wilted spinach with a unique apple reduction sauce. At $17, based on what I sampled, she got the better of the two dishes. With a fresh salad and lean duck to her liking she was perfectly content with the meal. My pork loin, however, was an utter disaster. Placed in front of me, just looking at the dish, there was the foreboding of having made the wrong choice. I had agonized over chicken schnitzel. From experience of cooking it I know that pork loin is wonderful but delicate. As pork it must be well cooked but just barely so. It is best to still be a hint of pink as that keeps it tender and flavorful. What was presented more resembled a blackened or barbecued brisket. Turning over some pieces they were obviously cooked to oblivion. Cutting into them, shredding actually, confirmed my worst fears. The au poivre was an interesting idea and could have worked with more attention from the chef. One wonders how the plate got by the pass. There was indeed that touted sauce but in a miserly portion buried somewhere under the meat. There was not enough to enhance the dry pork loin. The best part of the meal, ironically, was a garnish of local, seasonal, fresh peas. I would have been content with a full plate of them and dispense altogether with the failed protein. There was another garnish of slices of grilled, blackened sweet potato. It was nothing special and didn’t augment the plate. Given its off-putting nature there was more than enough meat in the full serving. Next time I would try a smaller portion and a couple of side dishes or perhaps a glass of wine or dessert. Looking about many of the diners were greeted by staff as regulars. Perhaps during future visits to Gloucester we will be as well. Next time I would have the nerve to send back a cold soup and reject an incinerated entrée. When enjoying fine dining hell is in the details. Our visit to the renowned Duckworth’s Bistrot was more like an evening in Purgatory. 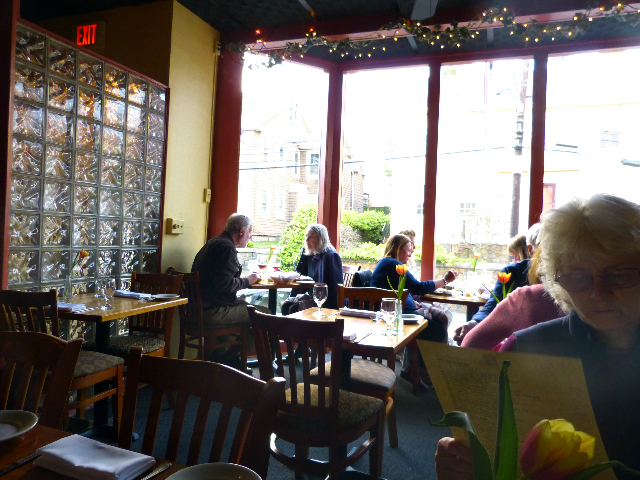 "For excellence of ambience, service, and French food, try our local The Mill on the Floss, in North Ashford, MA, on Rte.7--ten to fifteen minutes from Williams College. We had my birthday dinner there, on April30. What a treat and pleasure! One-- or this reader!-- so likes your phrase, "cooked to oblivion, " which seems relevant as well to Truth, in our times." 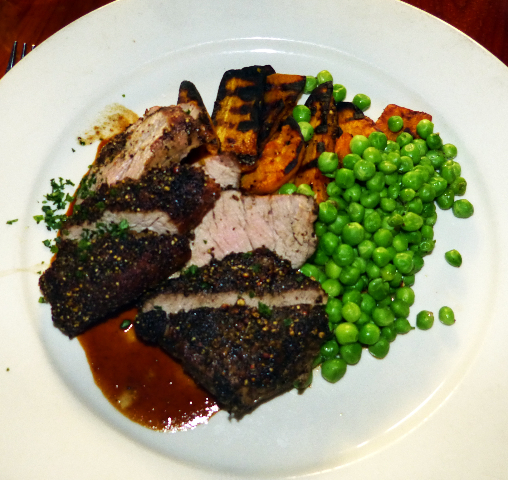 "Pork loin is tough in that it is easy to make it tough.Some restaurants cheat and marinate it.Thanks for saving us a possible bad experience.Some years ago I went to the old market in annisquam now a restaurant.It was good.great location at least."